An international team of scientists headed by researchers from The University of Texas at Dallas and Hanyang University in South Korea have created high-tech yarns with the ability to produce electricity upon being twisted or stretched. The scientists have reported on these “twistron” yarns and their prospective uses (e.g. tapping energy from temperature fluctuations as well as from oceanic wave motion) in an article published in the Science journal on 25 August 2017. The yarns, upon being sewn into clothing, functioned as a self-powered breathing monitor. “The easiest way to think of twistron harvesters is, you have a piece of yarn, you stretch it, and out comes electricity,” stated Dr. Carter Haines BS’11, PhD’15, who is one of the co-lead authors of the study as well as an associate research professor in the Alan G. MacDiarmid NanoTech Institute at UT Dallas. Scientists from South Korea, Virginia Tech, Wright-Patterson Air Force Base, and China also took part in the research. The yarns are developed from carbon nanotubes, that is, hollow carbon cylinders with a diameter that is 10,000 times smaller than that of a strand of human hair. 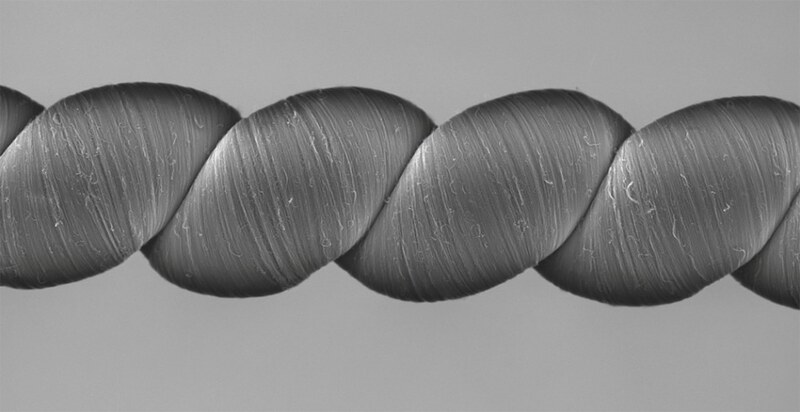 Initially, the scientists twisted and spun the nanotubes into lightweight, high-strength yarns. In order to render the yarns more elastic, they twisted it to an extent that the yarns were coiled like an over-twisted rubber band. For producing electricity, the yarns have to be immersed in or coated with an ionically conducting material (i.e. electrolyte) which can simply be a blend of common table salt and water. Fundamentally, these yarns are supercapacitors. In a normal capacitor, you use energy—like from a battery—to add charges to the capacitor. But in our case, when you insert the carbon nanotube yarn into an electrolyte bath, the yarns are charged by the electrolyte itself. No external battery, or voltage, is needed. Dr. Na Li, one of the co-lead authors of the study and a research scientist at the NanoTech Institute. According to Haines, upon stretching or twisting a carbon nanotube harvester yarn, its volume gets reduced, thereby causing the electric charges on the yarn to be closer together and increasing their energy. This in turn increases the voltage intrinsic to the charge deposited in the yarn, thus allowing the electricity to be tapped. According to Dr. Ray Baughman, a corresponding author of the study and director of the NanoTech Institute, when the coiled twistron yarns were stretched 30 times per second, 250 watts of peak electrical power was generated per kilogram of the yarn when normalized to the weight of the harvester. Laboratory experiments performed by the scientists demonstrated that a twistron yarn with weight less than that of a housefly can be used to power up a small LED which was lit up every time the yarn was stretched. In order to demonstrate that the twistrons have the ability to tap waste thermal energy from the environment, Li connected the twistron yarn to an artificial muscle made of polymer with the ability to contract and expand upon being heated and cooled. The twistron harvester transformed the mechanical energy produced by the polymer muscle into electrical energy. There is a lot of interest in using waste energy to power the Internet of Things, such as arrays of distributed sensors. Twistron technology might be exploited for such applications where changing batteries is impractical. The scientists sewed the twistron harvesters into a shirt, where the yarn got stretched upon normal breathing and produced an electrical signal, denoting its ability to be a self-powered respiration sensor. Electronic textiles are of major commercial interest, but how are you going to power them? Harvesting electrical energy from human motion is one strategy for eliminating the need for batteries. Our yarns produced over a hundred times higher electrical power per weight when stretched compared to other weavable fibers reported in the literature. In the lab we showed that our energy harvesters worked using a solution of table salt as the electrolyte. But we wanted to show that they would also work in ocean water, which is chemically more complex. Baughman, who is the Robert A. Welch Distinguished Chair in Chemistry in the School of Natural Sciences and Mathematics. During a proof-of-concept validation, Dr. Shi Hyeong Kim, one of the co-lead authors of the study and a postdoctoral researcher at the NanoTech Institute, deployed a coiled twistron in the sea by surfing surf off the freezing east coast of South Korea. He fixed a 10-cm-long yarn with a weight of just 1 mg, nearly equal to weight of a mosquito, between a balloon and a sinker floating on the seabed. Each time an ocean wave hit, the balloon was raised and caused the yarn to be stretched by nearly 25%, thus producing measured amount of electricity. Although the researchers used very little quantities of twistron yarn in the present research, they have demonstrated that the performance of the harvester can be enhanced not only by increasing the diameter of the twistron but also by operating many yarns all at the same time. If our twistron harvesters could be made less expensively, they might ultimately be able to harvest the enormous amount of energy available from ocean waves. However, at present these harvesters are most suitable for powering sensors and sensor communications. Based on demonstrated average power output, just 31 milligrams of carbon nanotube yarn harvester could provide the electrical energy needed to transmit a 2-kilobyte packet of data over a 100-meter radius every 10 seconds for the Internet of Things. Scientists from the UT Dallas Erik Jonsson School of Engineering and Computer Science and Lintec of America’s Nano-Science & Technology Center were also part of this research. A patent has been filed by the investigators for this technology. In the United States, the Air Force, the Air Force Office of Scientific Research, NASA, the Office of Naval Research, and the Robert A. Welch Foundation funded the study. In Korea, the Korea-U.S. Air Force Cooperation Program and the Creative Research Initiative Center for Self-powered Actuation of the National Research Foundation and the Ministry of Science supported the study.